With spring barging into our gardens and knocking on our doors, households are getting ready to welcome the spring holidays into their homes. If you, just like our catering team, like to plan ahead and are on a quest to make this year’s Easter remarkable, we have some menu and table decoration ideas that could help you. The star of any successful event is great food. No matter if it’s just a cozy family breakfast or a grand gathering of relatives, Easter is a time to celebrate, and enjoy delicious food. Here are our suggestions for an inspired Easter menu. Pastries - buns, croissants, muffins and scones. Spring is when nature comes back to life, so celebrate it by decorating your table with elements from nature. Flowers, feathers, wood, and herbs could be the main accents that complement the delicious food you’re serving and create an uplifting mood. For the flowers, nothing says “spring” more than the classic primroses, paperwhites, and tulips. Pair them with herbs, grass and wood branches from the garden, and you’ll make a perfect bouquet that adds color and life to your table. While some use traditional vases, others stash their flowers in mason jars, but if you want to go the extra mile, use painted hollowed out eggshells in an egg crate and turn them into tiny vases. 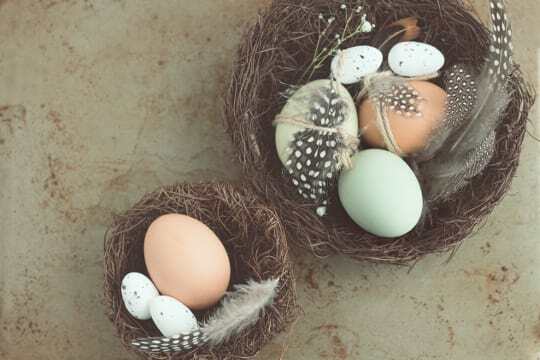 For the centerpiece, you could use a painted egg nest, and decorate it with feathers, herbs - anything your imagination comes up with. If you are a practical person and want a centerpiece that can be used more than once, paint wooden eggs - you’ll have a decoration you can use every year without any extra effort. Want functional decorations? You still have time to grow wheatgrass in tiny pots to place on your Easter table. Fruit, baby carrots, and salads can serve both as decorations and a healthy snack, chocolate eggs are sure to please both the children and the grown-ups, and while egg shaped candles look charming in daylight, they create a cozy atmosphere during dinner time. If you have time to create something truly special, check out Easter decoration ideas on Pinterest - you’ll definitely find inspiration and unique solutions. If you don’t have time to cook this easter, call us at (619) 304-0450 for holiday catering services in San Diego. Together we’ll craft a menu, that includes all of your favorite dishes, cook them with skill and inspiration, and present your Easter catering creatively and professionally. Our team specializes in cooking meals that highlight events and create the perfect mood for you to socialize with your guests. So, if you have your hands full this year, don’t be shy and contact us. We would be honored to cater your event.